An alternative to amalgam or silver fillings, cosmetic fillings have the advantage of being tooth colored, and thus less noticeable. Enamel is the thin, hard material that covers the dentin, or main body of your teeth, and protects it from harsh temperatures and daily wear and tear. Although enamel can withstand damage that the dentin can't, it doesn't have any living cells. Thus, it can't repair itself if it breaks or chips. For that, you'll need to see a dentist. There are many simple steps you and our dentist can take to help prevent damage to tooth enamel, or restore it after the damage is done. Interstitial spaces are gaps between the teeth. Interstice fillings close up these gaps, preventing food from getting stuck and creating a more beautiful smile. Diamond attachment filling is also known as “teeth jewelry.” The dentist attaches a thin flat back diamond onto the surface of the tooth. This type of “filling” does not interfere with brushing or dental hygiene. The area underneath the jewel is sealed to prevent bacteria from getting in. There is no drilling or pain involved. The jewel is bonded to the enamel of the tooth. The placement and removal of the jewel is similar to the placement and removal of orthodontic brackets. When it is removed, it is simply popped off and the tooth polished to remove any remaining bonding material. There are pores within the outer layer of the teeth that collect stains over time from coffee, tea and smoking. Teeth whitening treatments improve the appearance of discolored teeth by removing those stains. Many people are surprised at how bright and beautiful their teeth appear after these simple whitening procedures. Whitening is quickly done and safe for all ages. You can have just your upper teeth, just your lower teeth, or both upper and lower whitened, depending on the way you smile. 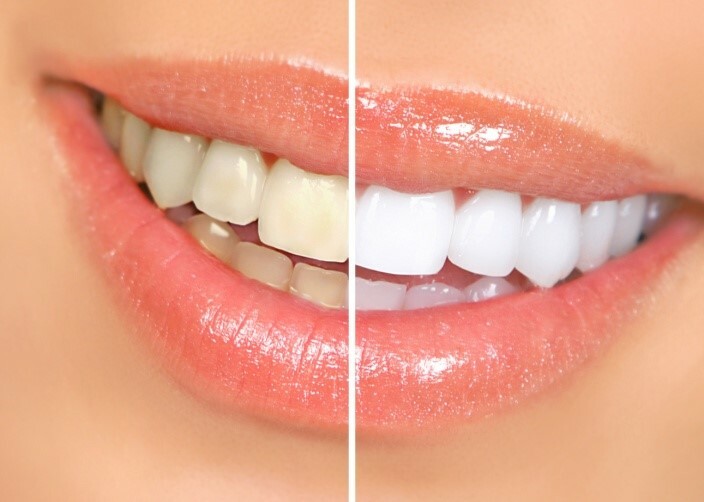 The degree of whitening achieved will differ from person to person, based on the condition of the emamel and the type of stains present on the teeth. The EMW Dental Ce offers two options for whitening, depending on your desired timeline and price point. This treatment involves plastic trays, which are customized to fit the shape of the patient’s teeth. 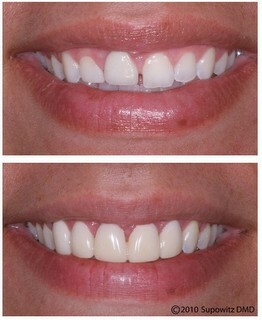 A small amount of whitening solution is then placed in the tray and worn on the teeth for a prescribed amount of time. 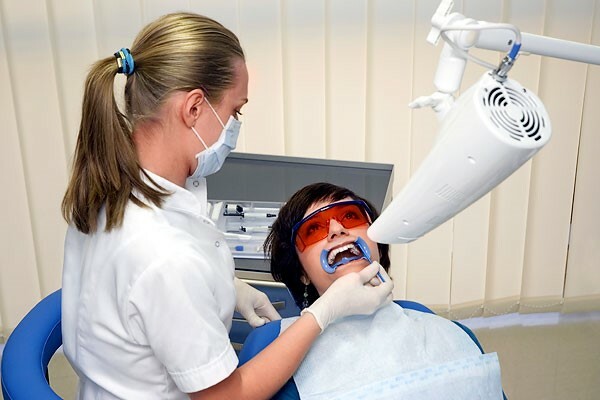 In this treatment, the dentist places the whitening solution directly onto the patient’s teeth and activates it with an ultraviolet light for a given time. This procedure normally takes one hour during one or two visits. 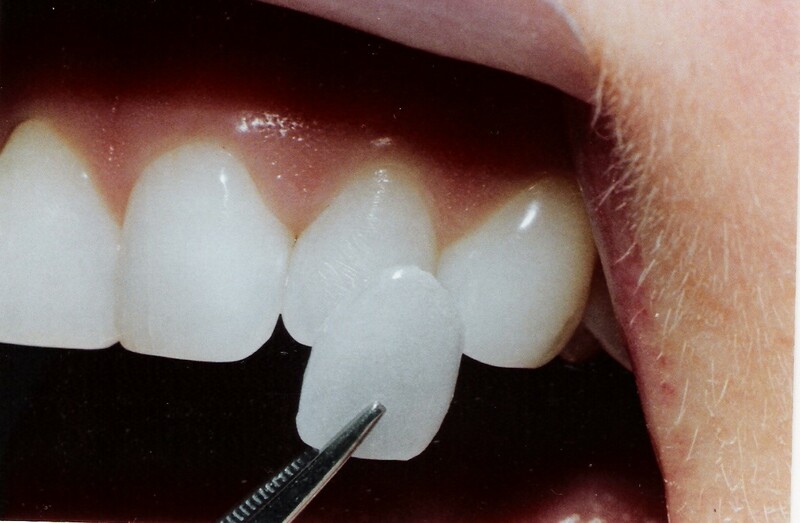 Veneers are a thin shell made out of porcelain or a composite material. They are custom made and cemented to the front surface of a tooth, like a false fingernail fitting over a nail. A veneer can be used to treat dental conditions such as a slightly crooked tooth, discolored teeth, chipped teeth or to cover spaces between the teeth. Veneers should last for many years, but they can chip or break, just as your own teeth can. A veneer takes at least two visits; the first to prepare the tooth and match the shade, and the second to fit it. Before bonding it in place, your dentist will show you the veneer on your tooth to make sure you are happy with it. An inlay is similar to a filling but the entire work lies within the cusps, or bumps, on the chewing surface of the tooth. An onlay, often referred to as a partial crown, is a more invasive and costly procedure. Both normally require two visits to complete. Inlays and onlays are most often used for "posterior" teeth, the teeth with flat surfaces in the back of your mouth that you use to chew. 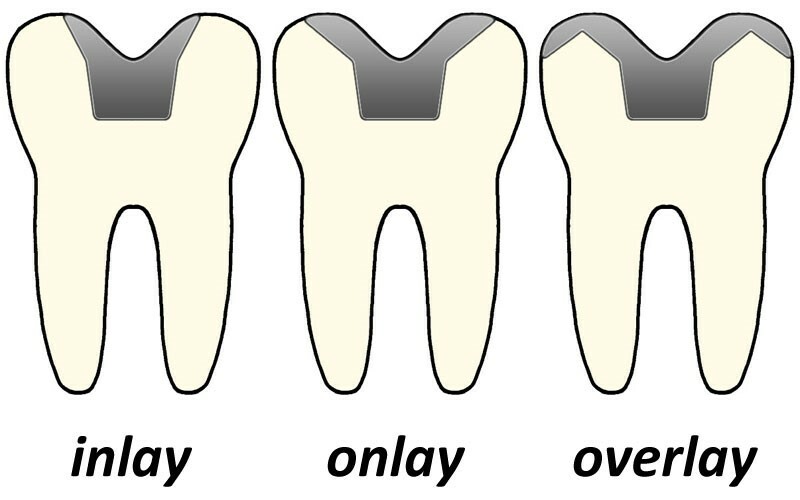 An inlay or onlay procedure involves the creation of a cast that is bonded to your tooth with various types of cement. Anyone, at any age, can lose a tooth. A missing tooth affects your ability to eat and to speak, as well as your appearance. Dental crowns and dental bridges are two options for correcting the problem. A dental crown is a cap made to fit over a damaged tooth. They are often made for teeth that are cracked or weakened due to tooth decay or the deterioration of an old, large filling. Our dentists may also recommend a crown after a root canal treatment if the existing tooth has become weak following the procedure. The crown covers the tooth, protecting it and restoring its proper shape. If your teeth have too much space between them, our dentists may recommend using a crown or series of crowns for better appearance. A crown usually lasts 20-30 years. A dental bridge is made with crowns and is used to fill in areas where teeth have been lost. 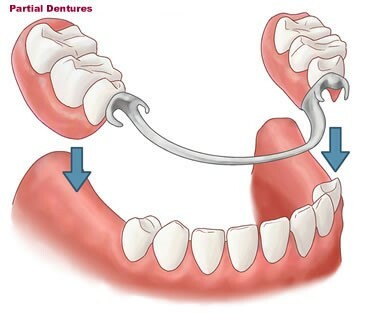 If you have lost one or more teeth between existing teeth, a dental bridge may be used to fill in the missing teeth. The bridge will help span the space with a crown that is attached to other crowns supported by the teeth adjacent to the space. Bridges may be made of porcelain or a combination of porcelain and gold. If one tooth has been lost, a bridge will be made with three porcelain crowns. If two teeth are missing, four crowns will be used. Both bridges and crowns provide a natural appearance and facilitate eating and speaking. Our dentists will be happy to discuss your options with you depending on your budget. 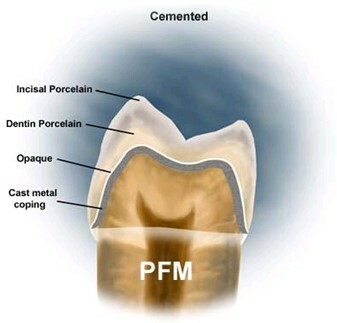 Porcelain fused to a metal crown is a hybrid between metal and porcelain crowns. A shell of metal is first made to fit over the tooth, then a veneer of porcelain is fused to the metal, giving the tooth a natural finish. 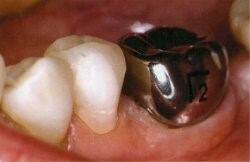 Titanium crowns can be shaped more easily than metal crowns. After the crown framework is cast in titanium, the tooth goes through an opaque process and a porcelain application is added to finish. Titanium castings are lighter than standard metal castings; hypoallergenic; mechanically strong; will not cause discomfort when eating hot/cold foods; and are physically neutral, with no “metallic” taste. The den tist’s preferred choice for dental crowns, zirconium crowns and bridges are so strong they can be used anywhere in the mouth. Zirconium crowns can withstand the biting pressure of the front teeth as well as back teeth grinding. Zirconium crowns allow light to pass through like a normal tooth and thus look more natural than other metal cores that block the light. A metal crown uses gold alloy, base metal alloy (such as nickel or chromium), or other alloys. Compared to other crowns, less tooth structure needs to be removed, and there is less chip and break with metal crowns. These crowns leave a metallic finish and are therefore only recommended for out of sight molars. Temporary bridges/crowns are made with acrylic or stainless steel. They are used as a temporary restoration until a permanent crown is constructed. A missing tooth can be replaced by a set of “partial dentures.” A plastic tooth is mounted on a removable plastic or metal plate, relieving discomfort and embarrassment, and allowing you to eat and smile freely. Teeth that are made abroad and then brought to our clinic to be made into dentures. Teeth that are made locally in Viet Nam, then made into dentures at our clinic. Teeth fabricated from porcelain, which substitute for a natural tooth. Dentures made with titanium are light and very strong. They are recommended for patients who prefer a strong, metal-based denture that feels as light as plastic. Titanium castings are lighter than metal; hypoallergenic; mechanically strong; will not cause discomfort when eating hot/cold foods; and are physically neutral, with no “metallic” taste. An impression of the jaw is made using an electrically non-conductive material. The impression's inner wall is treated with a low-melting alloy and the interior is packed with filling material. Fixing pins are inserted if there are crowns, casings or bridges. An electric conductive coating is then made by vaporizing the metal layer and applying lacquer. 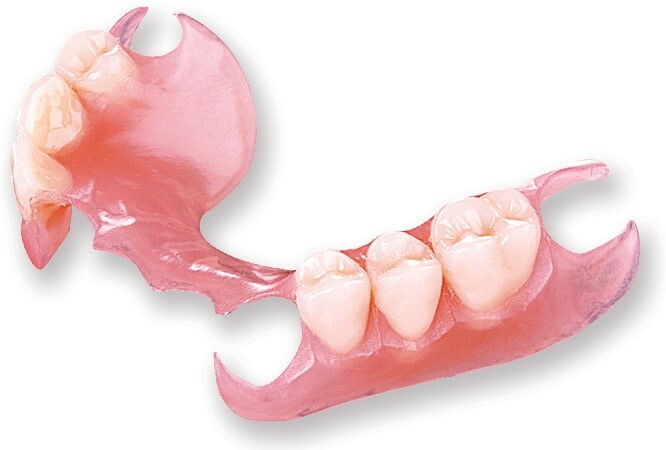 The actual dentures are separated from the impression and forged with the intermediate metal base. 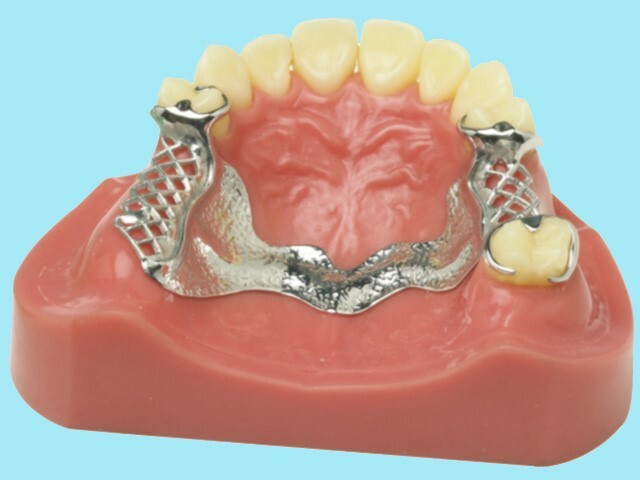 Metal dentures are more natural feeling than plastic dentures. They are also stronger and more stable.